Barcelona-based company Zero 2 Infinity has proceeded to the next level in its development plan with a new test flight. The wind conditions were particularly harsh and the test had to be terminated prematurely. However, this first test flight of the microbloon program is a significant step forward and brings the new Space company forward in its quest to develop safe, environmentally friendly and rapidly reusable Near Space launch capabilities. On May 29th, 2012, the team was ready on the launch pad in León, Spain, for the first test flight of microbloon 2.0, a 2-m-diameter pressurized pod designed by Zero 2 Infinity as a scaled model of the full Bloon pod that will carry 4 passengers and 2 pilots to 36 km, providing Near Space conditions for over 2 hours. The team had designed and built all the launch equipment. The primary aim of the test was to validate launch procedures and, if everything was nominal and the flight was completed, to perform on-board remote robotic tests and environmental and life support system testing for future inhabited flight scenarios for Bloon’s scientific, technological and experiential missions. Up through the inflation of the 35,000 m3 Zodiac balloon to just before the release of the balloon from the spool, all launch activities were smooth and flight systems were 100% functional. Just before the release, a strong and unpredictable wind gust caused the balloon to sail and spill and load air several times. 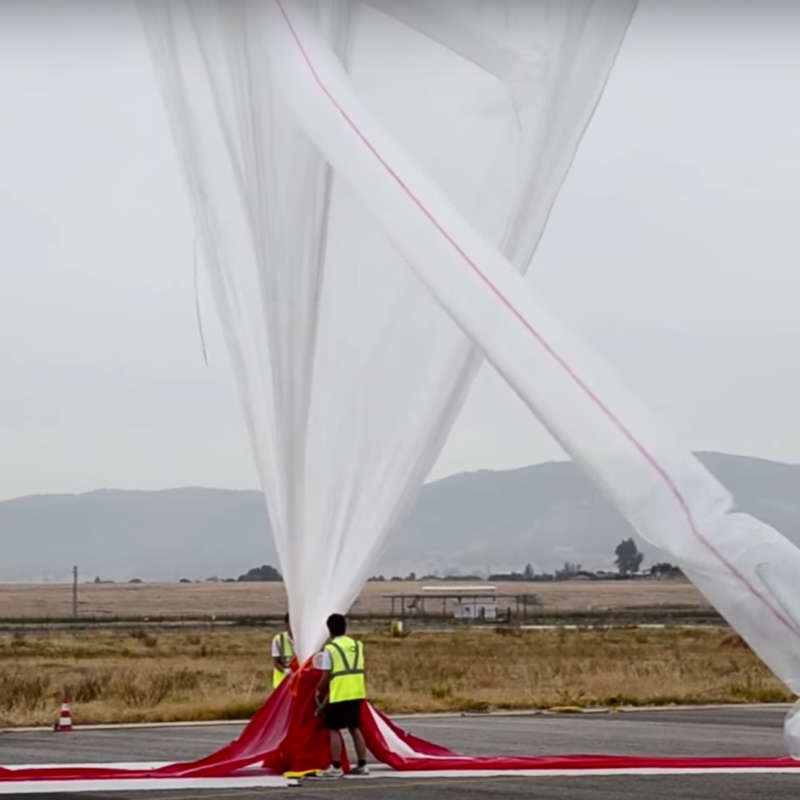 Initial inspection of the balloon did not reveal damage, so the launch operations continued. The balloon was released when the wind dropped, and quickly climbed up and over the launch vehicle. As the payload was released, the launch team quickly realized that the balloon had been damaged as the flight system slowly ascended approximately 5 meters above the launch vehicle and then began to descend setting the payload on the surface. Winds pushed the balloon a short distance along the grass near the runway until it was stopped by vegetation and quickly recovered. Once the balloon was laid out and inspected, a gore tear was discovered and it is believed to be the point of initial failure. The pod and its pilot, an android named Ironman (provided by Universidad Jaume I from Castelló, Spain), both had a shorter than expected flight, but were fully recovered along with the entire flight system, which is now being reconfigured for the next launch attempt. Although disappointed for not having completed the test, the Zero 2 Infinity team still records this as a success of their flight systems and procedures.